In the mid-1980s, the University of Florence and Pisa started collecting information about and doing research on the heritage of indigenous grape varietals in Tuscany. The Pugnitello grape was one of these, and in collaboration with the San Felice winery, it has since then been cultivated and studied in the experimental vineyard, the Vitiarium, of San Felice. The Pugnitello has ancient origins, as it is believed that the Etruscans cultivated Pugnitello already long before the Romans. It has further been stressed, that its place of origin in Tuscany could be the area around Grosseto. The name is considered to derive from the form of its small grape bunch which looks very much like a fist, a pugno in Italian. Another hypothesis for some time was that the name Pugnitello was a mix up of Pignatello, which is a synonym for the Sicilian grape variety Perricone. However, a later DNA analysis showed that this was not correct, but rather that Pugnitello and Perricone have completely different parentage. In 2003, it was registered as an official grape variety in the national register of the Italian Department of Agriculture. …its grape bunch is small, and the fruit has a lovely blue-black color with a thick skin. Pugnitello is a kind of grape variety that, just as happened to Fattoria di Montemaggio, you fall in love with thanks to its unique characteristics. However, it can be challenging to cultivate it as it is very sensitive to diseases and its ripening falls very late in mid-October. So you have to oversee it every day and take very good care of it to get a good result. Another difficulty is to cultivate it on high altitudes as in Radda. The wine produced from this grape has, in general, an intense red color with violet highlights, a very fruity, rich, and buttery taste, smooth tannins and is suitable for aging. Fattoria di Montemaggio produces the Ilaia di Montemaggio IGT Toscana which is 100% Pugnitello. 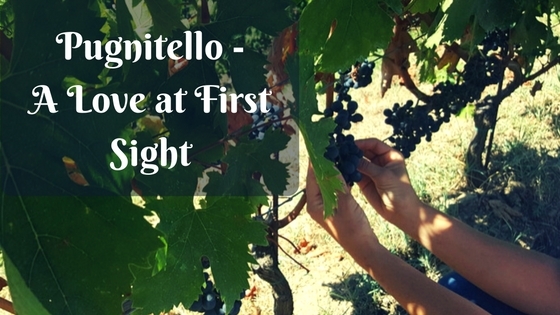 The grapes are harvested from the three quite small vineyard terraces with Pugnitello on the estate, where the vines are planted with a high density. The Ilaia di Montemaggio is fermented in steel vats and then aged for 18 months in oak barrels. As the yield is fairly low, Fattoria di Montemaggio so far produces less than 500 bottles a year of this wine. Therefore, it is hard to be able to purchase this wine as it ends fairly fast, however, if you visit Fattoria di Montemaggio for a tour and wine tasting you will have the possibility to taste this extraordinary wine. For more information about the wines of Fattoria di Montemaggio, click here.